I am not just avant-garde. I like to play all types of music… I like music with form, not atonal or aform… Sometimes they put me into a weird bag and want me to be weird, inaccessible. I think I am accessible. 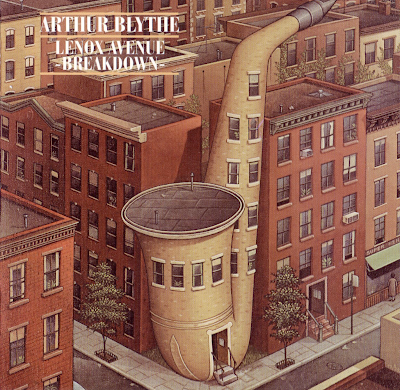 Forget what you've heard about Arthur Blythe, because it only gets in the way. Forget his outré all-star projects of the eighties, and even his In The Traditional material - Blythe was never in any cubby hole long enough to earn any labels. And unline fellow West Coaster Horace Tapscott, who opted to stay in California and, thus, has yet to get his share of the limelight, Blythe arrived at the New York loft scene in `73 to a flurry of acclaim and barbs alike. Forget those too. "Lenox Avenue Breakdown", recorded in `79, the same year as "In The Tradition", and ostensibly Blythe's most successfully listenable album, is anything BUT traditional. It's a unique melange to which Blythe never really returned, mostly thanks to the unusual nature of this septet. In fact, only the title tune really dwells on the clear-eyed jazz flats. The way the carefully-wrought melody plays over an almost lackadaisical pace points at a certain debt to composer Muhal Richard Abrams, or at least a similar that school - something which crystallized during Bob Stewart's Languid tuba solo. Abrams always has a special place for a tuba, and Blythe makes excellent use of it. The Afro-Caribbean groove of "Down San Diego Way" apparently has flautist James Newton right at home - he gets lots of space to wail, to play a little game of keep-away with Blythe, who, in turn, is characteristically intense, burgeoning, clean-as-a-whistle. Blythe is also in good spirits on the swaggering 7/4 "Slidin' Through," swinging tautly along. in fact, the only stumble comes on "Odessa", where drummer Jack DeJohnette takes his crash-banging one step too far and the whole affair becomes merely adversarial as the band tries to get it's riff out behind James "Blood" Ulmer's free-thrashing solo. Oh well. "Lenox Avenue Breakdown" is even likeable in its failures: always brash, always changing, and as good a place as any to start in blythe's discography. If you just can't leave those expectations at the door, well, just be prepared for a little shakeup. Looks pretty intrestin' Thanks Stylo. I'll be checking it out today. I want that house on the corner, by the way. yotte, you have to get to the back of the queue. JJ, Genji Sawai • Sowaka is back up. Great album, I've loved this one since it came out. how do i download this? can't see a link..